Pakistan’s film industry may be languishing in a pit of despair, but our TV industry is flourishing, despite all odds. Back in the eighties, under the dictatorship of General Zia-ul-Haq, restrictions on the Arts were similar to Iran under Ayatullah Khomeini. The once vibrant culture of the country, along with the casinos, wine shops and nightclubs, had been clamped shut under the guise of ‘Islamization’, imported directly from the Wahhabi/Salafist Saudi Arabia. Celebrating the new year (a Western new year, therefore incompatible with our ‘culture’—but not to the extent that the country switched from the Gregorian to the Islamic calendar) was a matter of great secrecy, and being caught with any kind of alcohol or Western music would have meant extended prison sentences. On TV, women were suddenly covered in swathes of cloth and everything began with a recitation from the Quran. We had one channel, PTV, and one source of news, the 9 o’clock Khabarnama that endlessly extolled the virtues of our dictator/president, Zia-ul-Haq. Perhaps, as with Faiz Ahmed Faiz, oppression gives rise to creativity, because some of the best traditions of Pakistani TV shows arose under the most oppressive regime we have ever had. Writers, artists and musicians from the eighties saved this country from madness. 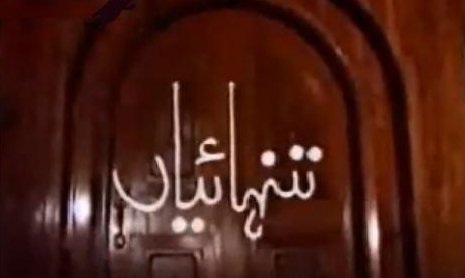 PTV, under strict censorship from the government, still managed to produce and present shows that were so popular that the streets would be empty on the nights those shows aired. Weddings that happened to fall on that night of the week were often delayed by hours as guests wouldn’t leave the house until after the show. Zia’s regime also gave rise to some of the finest Urdu satire we have ever seen, with stalwarts like Moin Akhtar, Bushra Ansari and the excellent Anwar Maqsood writing, producing and acting in comedy shows that took secretive, profound digs at our implacable leader. After Zia’s death (killed in a plane explosion that was rumoured to have killed several CIA bigwigs along with one or two of our generals), when the restrictions we had lived under for 11 years were finally lifted, the habits of that decade lingered. Creativity came out in the open. Schools for the Arts popped up everywhere, and great TV marched on. Benazir Bhutto and Mian Nawaz Sharif (cleverly dubbed‘BB’, which is a phonetic version of ‘bibi’, or woman, and ‘Mian’, literally meaning husband or man) battled for supremacy for eleven long years, with terms lasting as briefly as eighteen months and as long as four years. Each government was dismantled on accusations of massive corruption and ineffectiveness. But it wasn’t, ironically, until another general took over the country, that our media really took off. From 1988, when Zia’s reign ended, to 1999, we had 11 years of spotty ‘democracy’. The country saw, in quick succession, four governments rise and fall, a destructive game of musical chairs between two of the country’s largest political parties: the PPP (the Pakistan People’s Party), which was Bhutto’s legacy (Bhutto was found guilty of treason and hanged by Zia in 1979. The party was revived by his daughter, Benazir, in 1988) and the IJI (Islami Jamhoori Itehad, better known today as the Pakistan Muslim League – Nawaz, or PML-N), which was Zia’s legacy. His protege, Nawaz Sharif, carried on the dictator’s Islamization policies with a democratic twist. These were, and are, our two main parties, liberal and conservative. On the fateful night of October 12, 1999, Nawaz’s PML-N had already illegally removed the Supreme Court’s Chief Justice (PML-N members literally stormed the Supreme Court), had brought the country to the brink of default and the dreaded label of a ‘failed state’ and was pushing a bill through parliament that would have given him the powers and position of ‘Amir-ul-Momineen’, or ‘King of all Believers’. The move that actually brought his downfall was to illegally remove the Chief of Army Staff, and attempt to reroute the incoming COAS’s flight to India. When the coup came, Pakistan still had only two channels, and only one of those carried the news—PTV. Mian and BB had, successfully in their respective terms, suppressed dissent and debate by attacking two of the larger news organisations in the country: Dawn and The News International. They had kidnapped journalists, blocked the import of newsprint, held back and blocked the release of channel licenses that were affiliated with news organizations (one of the country’s most popular channels today, GEO, paid a full staff for eight years while they waited for their license. The editor of The Friday Times, a vocal critic of Nawaz’s government, Najam Sethi, was abducted from his home and returned a full year later. No one knows what happened exactly, but he is now a vocal supporter of Nawaz Sharif), and rumours of blackmail and threats to journalists’ and their families were rife. When the army, under General Musharraf, took over the country in 1999, BB was already in exile (threatened with cases of corruption filed by Nawaz), and Nawaz faced the courts he had attacked just a few months earlier. It was General Pervaiz Musharraf who finally released the channel licenses held back by the ‘democratic’ governments, and under the 8 years of his rule, our viewing pleasure jumped from two channels to over 80. Newspapers, national and regional, Urdu and English, multiplied. Conversely, the stellar standards enjoyed by our TV shows plummeted. An industry without experience (outside of PTV who jealously guarded their knowledge), TV took on young blood by the bucketload, hoping they would all learn ‘on the job’. In a scramble to find content, channels started soaps patterned on Indian TV, all glamour and no substance. They bought shows from Turkey and dubbed them into Urdu. Local production companies cropped up everywhere, but the demand far outweighed supply, and the resulting shows were often sloppy and crass. Competition for ratings among news channels suddenly turned every statement uttered by our politicians (because, unlike Zia’s tenure, Musharraf retained his position as President under a semi-autonomous ‘democracy’) into ‘breaking news’. Analysts discovered the joy of on-screen rabble-rousing arguments between opposing parties, and when the time came to take down a ‘dictator’, they were front and centre in denouncing the very man who gave them their freedom. You can’t keep good Pakistani TV down, however. In more recent years, it turns out that the young blood has actually learned, on the job, to produce more quality and less quantity. With the support of legends such as Sultana Siddiqui (one of the country’s finest directors) and Javed Jabbar (an advertiser-turned-politician, whose daughter, Mehreen Jabbar, is another up and coming director with exemplary credentials), channels devoted purely to entertainment have revived the standards of the eighties. This time, Pakistan has gone global. Shows like ‘Humsafar’ and ‘Zindagi Gulzar Hai’ are travelling around the world to Pakistan’s own diaspora and beyond. We’re returning to our glory days, faster than one would have expected, but against the landscape of politics and power-grabs that we live in, it would be impossible not to do so. We have so much, you see, to feed on. Political and social issues are abundant, providing a never-ending stream of ideas to sate our creative minds. If Jon Stewart lived in Pakistan, he would have gone crazy in the first year. Pakistan’s history reads like a soap opera. Take, for instance, the case of Benazir’s son, Bilawal. Benazir was assassinated in December 2007—in itself, a movie waiting to be made. But in a shocking move for a ‘democratic’ personality, Benazir left her political party, in her will, to her son. Yes, you read that right. The PPP was handed down like personal property to her heir and successor, the 18-year-old Bilawal Zardari, who co-chairs the country’s largest party with his father (also named in the will), Asif Zardari. Asif Zardari, in a successful attempt to get out of money-laundering charges against him in Switzerland, had himself declared mentally unstable by a psychiatrist in the US. He was elected President of Pakistan in 2008 and served out a five-year term where we saw inflation rise exponentially and the problems of the country multiply alarmingly. Nawaz Sharif, who had taken a Saudi-engineered deal to escape prosecution in 1999 that included a twenty-year ban on entering politics and a ten-year ban on returning to Pakistan (he was convicted of hi-jacking the plane carrying our COAS in 1999), returned three years before his ban ended. At the time, the judge who had convicted Nawaz, Iftikhar Chaudhry, was under investigation for corruption and nepotism. In a brilliant play, Nawaz funded and engineered a lawyer’s uprising to restore Iftikhar Chaudhry to his seat as Chief Justice. Not surprisingly, after the dust settled and the ‘dictator’ had been deposed, the hijacking case quietly went away, as did a number of corruption cases against Nawaz. And this is all happened over the last eight years. We are currently witnessing a civilian coup in action. 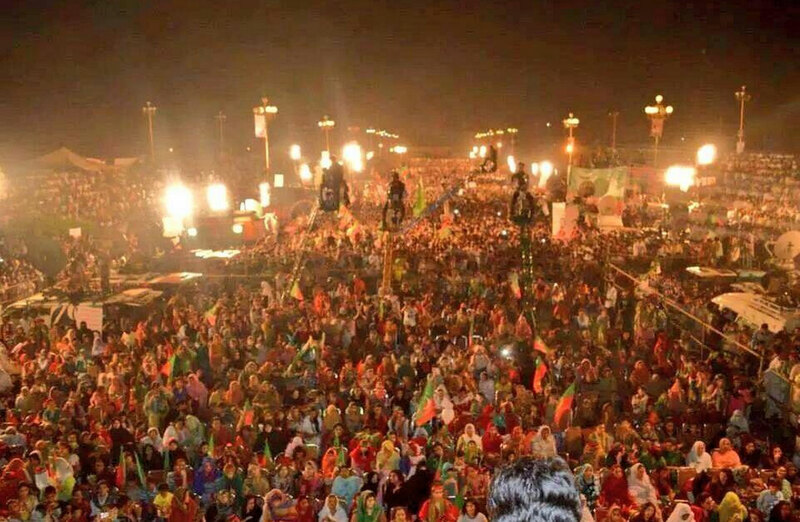 Imran Khan (a relatively new entrant into Pakistani politics) has gathered thousands of supporters for an extended sit-in in Islamabad, right in front of Parliament House, to protest rigged elections (2013). While the entire country knows that the elections were rigged (there are numerous eye-witness accounts to attest to this fact), in the fifteen months that Nawaz has been in power, his government has denied access to polling data and suppressed investigations into the elections. Imran Khan, frustrated over the lack of progress, has refused to accept Nawaz as Prime Minister until an impartial and thorough investigation can be conducted. He’s using people power to make his point. He’s joined by the followers of a cleric, Tahir-ul-Qadri, who is asking Nawaz Sharif and Shahbaz Sharif (Nawaz’s brother and Chief Minister of the country’s largest province, Punjab) to resign from office and for sweeping reforms of the electoral process. His demand comes on the heels of a police-state-like operation that killed 14 of Tahir-ul-Qadri’s supporters. The government has been refusing to file a police report for the deaths of those 14 people, mostly because the report would implicate the Sharif brothers in the murders. As de facto kings of the country, criminal charges could potentially damage their bid to remain in power forever. Tahir-ul-Qadri’s protesters have not left their positions in 14 days. 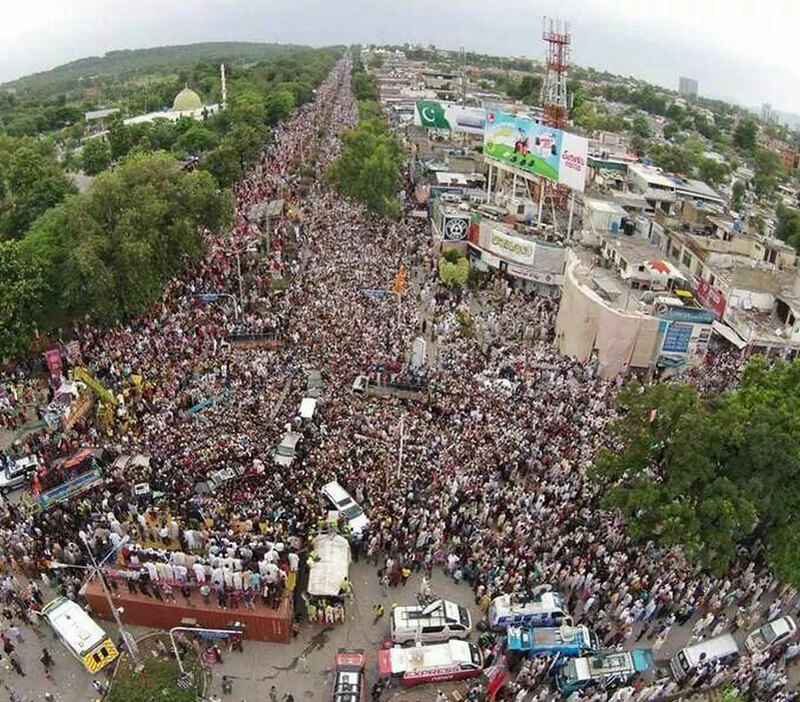 It’s been over two weeks since Imran Khan and Tahir-ul-Qadri marched to the capital. The number of people in both camps is growing. Expatriate Pakistanis are flying back into the country to take part in Imran Khan’s protests. Similar protests are sprouting up in other cities around Pakistan. And the government is stalling. In a suicidal (according to analysts) move, Nawaz Sharif temporarily handed over the problem to the army, which invited a backlash from the politicians supporting him. He compounded the error by lying about it on the floor of the Parliament. Nawaz’s tenuous relationship with the army (ironic, since he got his political start under the tutelage of Zia, a military dictator) has worsened over the years because of his vendetta against General Pervaiz Musharraf, which is currently being played out in a trial for treason in the Supreme Court. This environment of comic politics and sad neglect of social issues is a fertile breeding ground for our artists, for our musicians (check out Shahzad Roy and Strings, both politically-inclined musicians singing about the country), for our writers (stories like Agency Rules and The Prisoner are now making the rounds), for our actors and directors. New movies on the horizon are finally reviving our dormant movie industry. Theatre is witnessing a growth from being the purview of the elite to a much broader audience, with plays actually doing long-term business. With so much material available to us, it would be difficult not to find ideas. Our leaders should be commended for making life so entertaining. Because in the thirty years that I have lived here, I have witnessed the end of one military coup, the enactment of a second, an operation to wipe out pesky opponents (Operation Clean-up in Karachi in the nineties, which ruthlessly murdered over 15,000 political activists—potential opponents of the PPP and PML-N governments), an uprising by the legal community to reinstate a corrupt judge to the highest judicial office in the land, the return of Asif Zardari (known popularly as Mr. Ten-percent, his standard fee for any and every public and private venture in the country, which he enforced through intimidation. He was husband to the Prime Minister at the time), suicide bombings, drone attacks, cross-border antics with India (whose relentless construction of illegal dams block our supply of water from Occupied Kashmir. We fought a small war with them in Kargil in 1998. It’s pretty well-known), and becoming a nuclear power. It’s a miracle we aren’t all writing about politics, because the potential for satire, conspiracy theories and outrageous plot twists is endless. Nothing in our fiction matches the realities of Pakistan. No character we could create would outdo the politicians of the land. No dialogue our imaginations could conceive would ever match the audacity and brashness of our journalists and media personalities. If our creative population languishes in obscurity, it will be because of an overload of ideas, not a dearth. If you’re ever stuck for ideas, I would recommend researching Pakistan’s history (any decade will do). We’ve seen it all. A fascinating insider’s view of the political shenanigans in Pakistan, Natasha, although perhaps shenanigans isn’t quite the right word as it has a more innocent implication than murder, bribery, sleaze and corruption on such a scale. I can’t imagine the mentality it takes to behave in this way – as if there will never be a reckoning. Basically as far as I can see, it’s a criminal mentality, and criminals are predators without empathy or compassion. Interesting how the creative impulse can’t be exterminated despite all efforts, and endeavours to suppress free expression only results in a greater flourishing of the thing they seek to suppress, which is a testament to the resilience of the human spirit. Thanks, Teagan. This is just the tip of the iceberg. A neat skimming of the depths of depravity to which our politics have sunk. As you say, the problem is that none of these people are accountable. Think feudals from the Middle Ages, and you’ll come close to understanding their mentalities.